What Makes .38 Special Ammunition So Special? Home What Makes .38 Special Ammunition So Special? Even if you own a top-of-the line firearm, it will still fail it it’s loaded with subpar ammunition. When you find yourself in a dangerous situation, it’s simply unacceptable to not be prepared. Therefore, it’s always wise to invest in the proper ammunition. 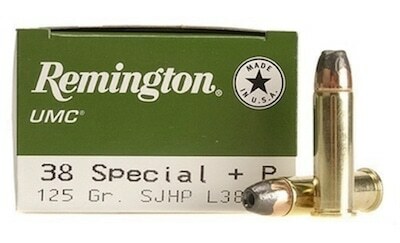 For this review, we will highlight the best .38 Special Ammunition. If you own a .38 Special, or if you’re thinking of purchasing one, you’ll definitely need the best ammunition. Why? Because choosing the right ammunition is just as important as choosing the best weapon for defense. These days, with so many options to choose from, it can be really difficult to distinguish which ammunition is best and the right choice for you. Let’s dive in and review some facts about the iconic 38 Special Revolver. The .38 Special was introduced in 1898 as an upgrade to the .38 Long Colt during the Philippine–American War. But changes needed to be made and the powder charge was increased from 18 grains to 21.5 grains of black powder. The bullet weight also needed to be 150 to 158 grains. The .38 Special is well known for its accuracy and relatively mellow recoil. It’s a rimmed, centerfire cartridge designed by Smith & Wesson, and is most commonly used in revolvers. However, some semi-automatic pistols and carbines also use this round. In addition, the .38 Special was the standard service cartridge of most police departments in the United States from the 1920s to the 1990s. It was also a common sidearm cartridge used by soldiers in World War I. As for modern society, the .38 Special is appealing to today’s gun owners who value their simplicity and ease of use. An example of this easiness is the revolver’s ability to be swiftly hidden in either an ankle holster or pocket holster. The .38 Special has become (and will most likely remain) the best selling and widely used revolver round in the world. One of the best features of a .38 revolver is the ammunition suite. 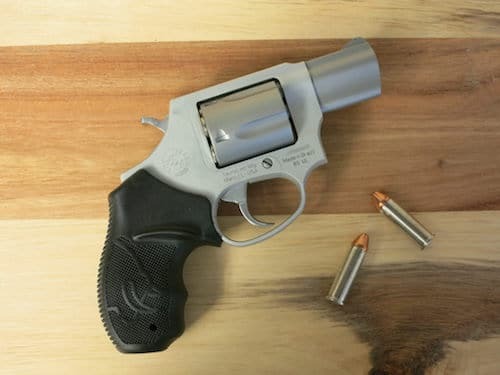 If you’ve ever owned a .38 Special, then you know you have the option to fire varying bullet weights and pressure loadings in the same revolver. During the 1950s and 60s, law enforcement voiced their concerns about the need for more stopping power of the standard .38 Special. Many ammunition manufacturers listened — and responded by going back to the drawing board. The result was the new and improved cartridge chamber pressure. Additionally, the Federal Bureau of Investigation began experimenting with a combination of heavier powder charges and modifications to the traditional 158-grain bullet. This grain bullet is an unjacketed lead semi-wadcutter hollow point and the FBI eventually came up with the .38 Special +P designation. Their efforts resulted in highly anticipated success, as the .38 Special +P proved to be more efficient at stopping criminals. It was so successful that many law enforcement agencies adopted the +P round afterward. 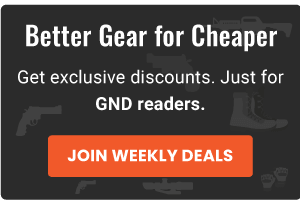 Now that we’ve reviewed the origins of the .38 Special and improved ammunition, let’s take a look at some of the best .38 Special Ammunition on the market today. The American Gunner line of ammunition is a massive collection of trustworthy loads. The most common users are shooters for competitive shooting, hunting or self-defense and law enforcement needs. Designed with premium components, American Gunner ammunition combines generations of ballistics know-how with today’s technology. Offered at an affordable price, the cartridges use Hornady’s XTP (Extreme Terminal Performance) bullets — that are shaped to maximize accuracy. In addition, they include serrations that break the bullet and cartridge into sections. This unique feature gets expansion started quickly, even when the bullet moves slowly. 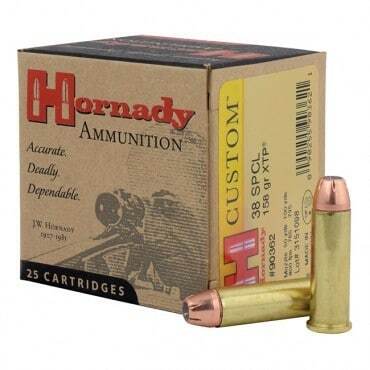 Hornady also uses extremely good primers and cases to make sure that the ammunition can function reliably. All of these excellent features make for a balanced cartridge that’s the right choice for daily use in a wide majority of weapons. 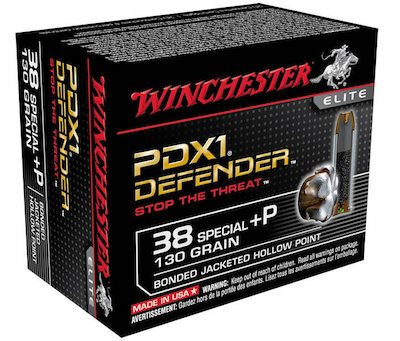 Winchester PDX ammunition has really impressive expansion and distinguishable velocities at diverse ranges via the Winchester Proprietary Bonding Process. In fact, Winchester PDX1 ammunition was tested by the FBI to see if it could stand up to actual life-threatening situations. The bonding process was created by Winchester’s engineers. These engineers welded together the lead core and copper jacket to obtain controlled expansion and a higher weight retention. This resilient bonding can take on the toughest barriers at varied ranges and velocities to simulate real world threat. Upon impact, the jacketed hollow point will initiate expansion up to 1-1/2 times the size of the original bullet diameter. The final result is a unique notching in the bullet that creates six equal segments creating maximum expansion on impact. 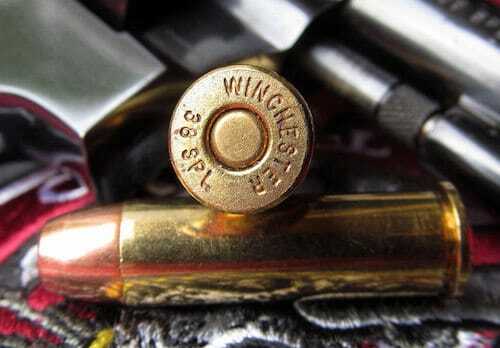 As for your .38 Special … don’t hesitate — the Winchester PDX1 is an incredibly smart choice! Liberty Ammunition has a long history of quality assurance and precise standards. 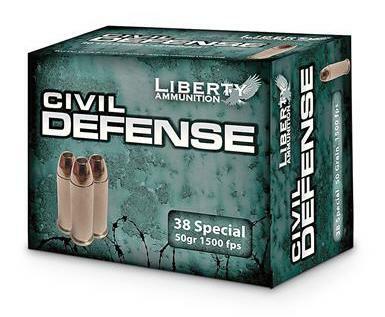 Their ammunition is a consistent and reliable performance that won’t disappoint. So how does the Civil Defense stand apart from the competition? Well for one thing, it holds an impressive muzzle velocity — which can exceed 1500 feet per second. Most shooters choose the Civil Defense because it’s a fairly light bullet and they can handle the recoil — even at a high speed. Constructed of copper and plated with nickel, the bullet discourages any barrel twists. And the ammunition’s case is also plated with nickel to ensure smooth feeding. The Civil Defense ammunition is a perfect choice for nighttime use or in low light because the propellant produces very little muzzle flare. Like any superior cartridge, it does come with a hefty price. But, not to worry, the quality is so undeniable, it justifies the price! The Remington name has a vast history of unparalleled craftsmanship. 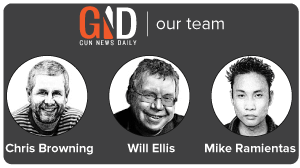 The company is an industry leader in both firearms and ammunition manufacturing. If you own a highly reputable firearm, you probably know that you need high quality ammuniton. Because with any excellent firearm, superior quality ammunition is a must in order for it to perform at its heightened potential. Remington uses the best components along with the newest technology techniques. Because they follow this path, they’re well equipped to manufacture some of the best ammunition available today. More specifically, Remington Ultimate Defense ammunition is enhanced to work best in compact handguns and it’s often the best .38 special ammunition for them. The reason is they expand heavily on contact with the target to increase the chances of striking them down. In addition, because this ammunition is designed to be predictable through all common obstacles, it’s a popular choice in multiple law enforcement agencies. The Ultimate Defense is made with Remington’s unique Driving Band Technology. Therefore, your accuracy will be precise and spot on. In addition, Ultimate Defense ammunition is treated to reduce muzzle flare, making it a wise choice for nocturnal shooting. Hornady XTP ammunition is manufactured with precision and straight from the factory. The XTP® (eXtreme Terminal Performance) ammunition is new production, non-corrosive, and in boxer primed, reloadable brass cases. The XTP is designed with a standard pressure load relevant for subcompact carry pistols. 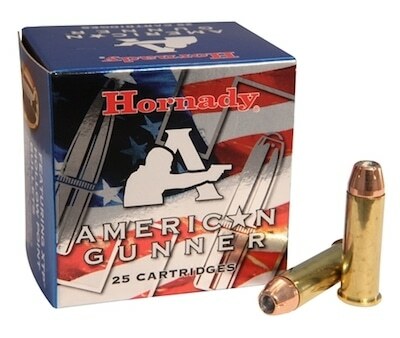 Additionally, these defensive cartridges from Hornady fire a 125 grain jacketed hollow point XTP bullet at an above-average muzzle velocity of 900 feet per second. Overall,the XTP bullet is an expanding design with a proven reputation for delivering robust infiltration — this allows it to strike an attacker or threat. Finally, each box of XTP is offered at an affordable price and contains a generous 25 rounds. Buffalo Bore produces tough and heavy ammunition that works best with smaller revolvers — but technically, it’s made for modern firearms and not intended for older guns. The Buffalo Bore company loads their ammunition up to maximum SAAMI specifications, which delivers extraordinary performance on many game. Their newly upgraded Heavy ammunition is an example of their superior craftsmanship. It uses a gas check to stop it from leading the gun when it’s fired, and offers reasonably good penetration. This will maximize the effectiveness of your .38 Special revolver! A cool feature about the Heavy is the flash suppressed powder to not burden your vision in low light situations. 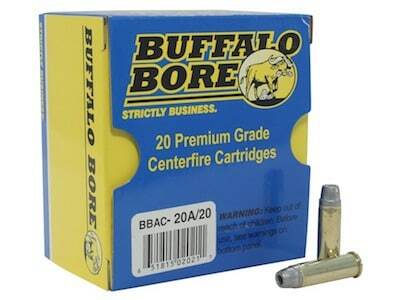 However, the Buffalo Bore Heavy is on the expensive side, but if you use a short pistol, definitely consider these cartridges. The newly upgraded Buffalo Bore Heavy 38 SPL+P ammunition will blow your mind! Since 1926, Magtech has manufactured their own segments and offered their customers full quality control over each stage of the manufacturing process. The Magtech brand name is recognized internationally and is sold in more than 50 countries worldwide. It’s designed, constructed, and tested in one of the largest and most modern small arms manufacturing facilities in the world. Magtech uses only the highest quality materials, cutting-edge manufacturing techniques, and state-of-the-art equipment to deliver exceptional standards. The company’s number one objective is to provide shooting enthusiasts with reliable and affordable ammunition. 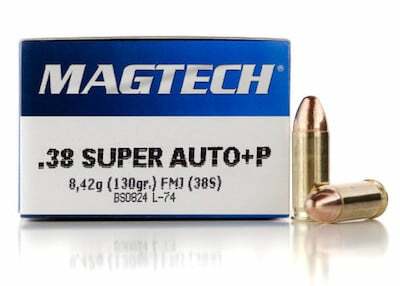 In addition, the Magtech .38 Special ammunition is the choice of top competitive shooters, Jerry Miculek and Mark Hanish. If you’re looking for suitable budget ammunition, Magtech ammunition is your best bet. Because the price is very low, it’s easy to practice extensively without breaking your budget. And because lengthy practice is vital for best results in an emergency, it’s always wise to practice with the ammunition that you intend to use in the field. The Magtech offers power that is comparable to most others, however, its use of a full metal jacket does limit extension. Ultimately, it’s pretty reliable for most applications. However, we did encounter minor problems as opposed to the other ammunition in this review. Prepare for the occasional jam. As we all know, smart shooters should pick their ammunition as carefully as they choose their firearm. First and foremost, look for something functional and use caution. When you’re shopping for the best .38 Special Ammunition, you should always consider your situation. A rule of thumb is to choose your ammunition that’s tailored to your location. In addition, consider tolerance for recoil, and then decide your price range. If you take into account each of these important factors, you’re destined to find the best. Good luck!